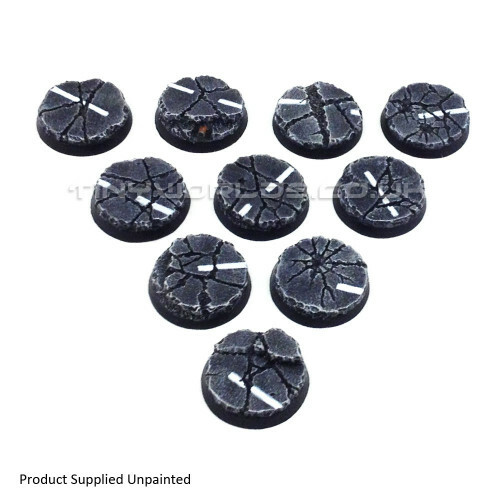 A set of 10 detailed 32mm round model bases suitable for many fantasy and sci-fi wargames. These stunning bases are ideal for adding that extra level of detail to your models, quickly and hassle free. These bases depict a graphic urban rubble texture ideally suited to modern or sci fi warfare. Made from a durable cast polyurethane resin, these bases are suppled unpainted and without flock. Painted examples shown to clarify detail. The bases are easy to paint with a superb level of detail and can be freely mixed with bases from many other manufacturers to produce a unique unit.